Dvořák’s colorful romantic fairy tale, based on the classic story of the Little Mermaid, comes to life with the enchanting Gabriela Beňačková in the title role, the water nymph Rusalka who sings the famous “Song to the Moon.” Ben Heppner stars as the Prince she falls in love with. Sergei Koptchak is Rusalka’s father, the Water Gnome, Stefania Toczyska sings the witch Ježibaba, and Janis Martin is the Foreign Princess, Rusalka’s rival. 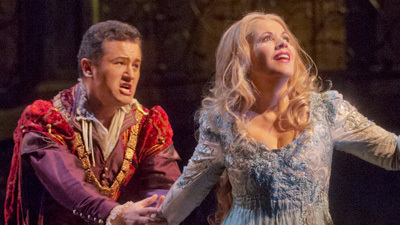 John Fiore conducts this performance from the opera’s Met premiere run.